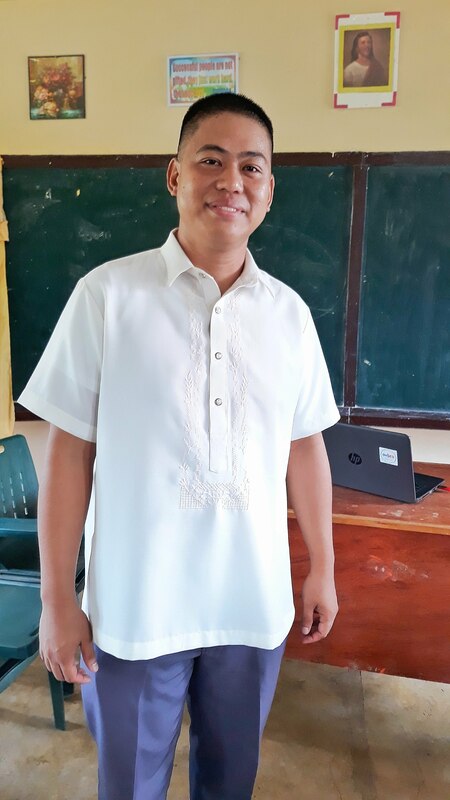 Principal Jopet Lirazan of the Puente Bunglas Elementary School in Ajuy, Iloilo, did not realize how much damage his school incurred until he went out of his house and saw the bits and pieces scattered about. Typhoon Yolanda’s powerful winds claimed thousands of lives and brought down homes and buildings, including their school. “Wala talagang natira sa mga bubong ng walo naming classroom,” recalled Mr. Lirazan adding that the typhoon carried some parts of the roof and ceiling several meters away from the classrooms. Judging by the extent of the damage, Mr. Lirazan knew that it will take a lot of time and money to rebuild the damaged classrooms — something that the school didn’t have. When classes resumed, the students had to make do with whatever was left. “Pag umuulan, nababasa yung aming mga estudyante at kung mainit naman, wala silang masisilungan,” he shared. Students of Capagao Elementary School in Capiz also suffered the same fate. Here, almost all of the school’s textbooks were rendered unusable by the typhoon. The teachers and students tried to salvage some of them but to no avail. “Kawawa talaga ‘yung mga bata. Halos isang buwan kaming nagtiis na trapal lang ang bubong ng mga classroom namin,” recalled Grade 6 teacher Ms. Conielyn Dapugo whose classroom is almost unrecognizable. Immediately after the typhoon hit, the Foundation sent Meralco power restoration teams to help local electric cooperatives bring back power in Leyte, Iloilo, Capiz and Aklan. In the course of fulfilling their mission, Meralco engineers and linemen came across badly damaged public school buildings in their assigned areas. Moved by the heart-rending condition of the students, they turned to the Foundation for help. The Foundation staff immediately made an assessment and determined the priority areas primarily based on the amount of devastation incurred by the school. 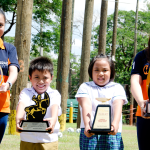 To engage more employees to help, Meralco launched the “1 Day 2 Give” campaign to help fund the classroom rehabilitation project. Employees were encouraged to give at least a day’s worth of their pay to the cause. 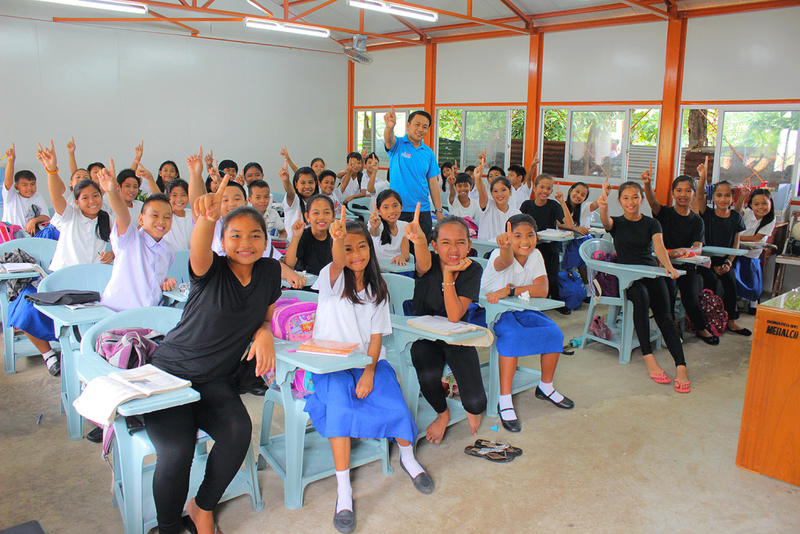 Each classroom is equipped with orbit fans, LED lights, monoblock arm chairs, a teachers’ table and a chalkboard donated by the Meralco Employees Fund for Charity (MEFCI). To ensure that the classrooms will not suffer the same fate as the ones they replaced should a typhoon of Yolanda’s scale comes around, the Foundation opted for the use of heavy duty materials, which were pre-fabricated before they were shipped and assembled on-location. “I was teary-eyed when I learned that the funds used for the construction of our classrooms came from the pockets of the employees. It is not everyday that we meet people who are willing to set aside a portion of their pay just to meet the needs of other people especially in the education sector,” shared Felisa Beriong, Assistant Schools Division Superintendent of Capiz who also graced the turnover ceremonies in the province. Ms. Beriong personally visited the schools under her supervision days after the typhoon and saw the amount of devastation it caused. Many of the text books were washed away and students spent the first few days after the resumption of classes drying their text books under the sun. To somehow make up for the loss, the Foundation also donated books and other learning materials aligned with the K to 12 curriculum to all of the 18 schools. 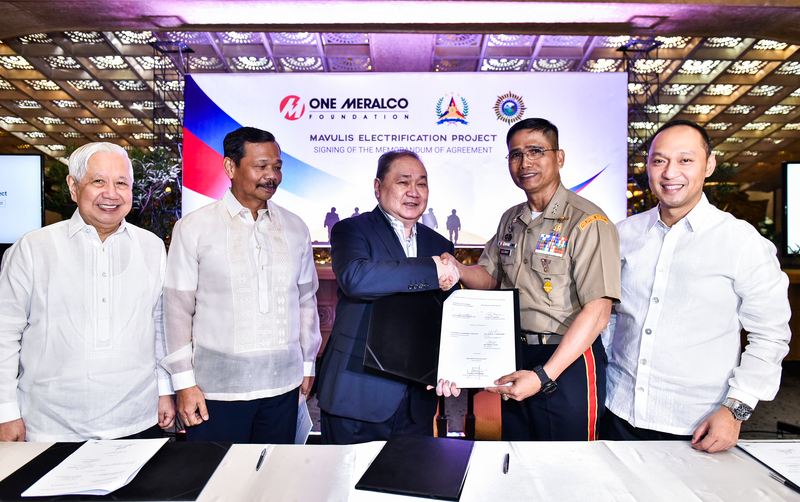 The Foundation’s school rehabilitation project owes its success to the generosity of Meralco and its employees who did not hesitate to draw from their own pockets to bring back normalcy in the lives of school children affected by Typhoon Yolanda.